Flooding and Indoor Air Quality – microBEnet: the microbiology of the Built Environment network. In the United States, floods are the most common natural disaster (NFIP, 2013). Climate change is predicted to increase the frequency of precipitation extremes in the Northern Hemisphere, leading to increased flood risks (Min et al., 2011; Pall et al., 2011). Studies suggest both general flooding and extreme flood events will become increasingly frequent as climate change progresses (Pall et al., 2011; Lin et al., 2012). Floods have been identified as a main hazard to human health associated with future climate change (McMichael et al., 2006). Coastal regions, especially the Gulf of Mexico and Atlantic regions, frequently experience tropical storm- and hurricane-caused flooding; homes in the mountain west often experience flooding attributed to snowmelt or flash floods; and in the Midwest, heavy rains leading to flash floods are common. Boulder, Colorado just experienced its 100-y flood and the Front Range of Colorado has been devastated by damage to thousands of homes, hundreds of roads, not to mention devastation to the natural landscape. Household damage due to water intrusion is not only financially and psychologically devastating, but the growth of microbes in the home following a flood may also lead to health risks for the inhabitants (Ahern et al., 2005). Extensive water damage after hurricanes and floods increases mold contamination in buildings (Fabian et al., 2005; Riggs et al., 2005; MMWR, 2006). After Hurricanes Katrina and Rita in New Orleans, visible mold growth was documented in 44% of the residences (Riggs et al., 2005), elevated air concentrations of mold spores were measured outdoors and indoors (Solomon et al., 2005), and endotoxin levels were elevated in water-damaged homes (Rao et al., 2007). 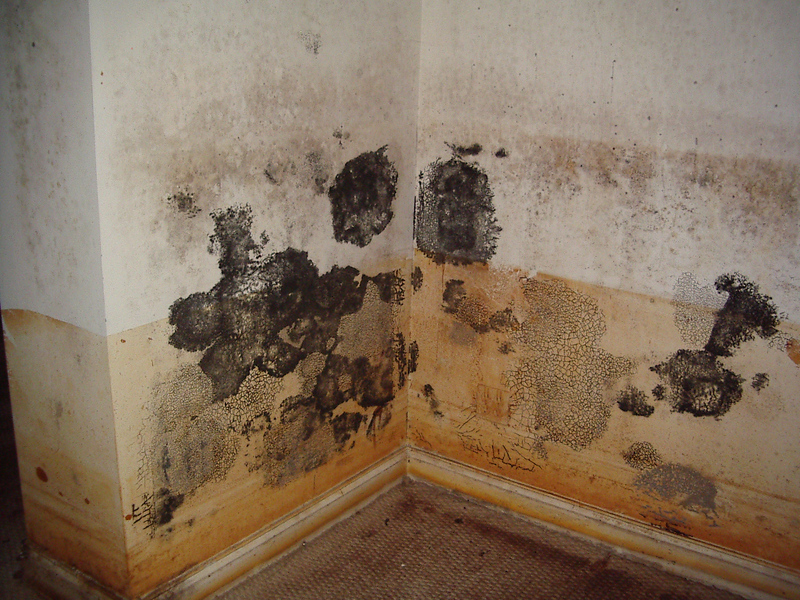 The CDC recommends that in homes that have been wet for more than 2 days, remediation should occur quickly and exposure to mold-contaminated materials can cause adverse health effects in susceptible persons (MMWR, 2006). Health effects associated with floods occur in two waves: the immediate increase of morbidity and mortality during and directly following floods, and the respiratory and immune response issues that arise after exposure to contaminated surfaces and air in water-damaged buildings. Exposure to microbiological contaminants in water-damaged and damp buildings has been linked to asthma, lower respiratory issues, rhinosinusitis, and rhinoconjunctivitis (Simoni et al., 2005; Park et al., 2006; Pekkanen et al., 2007; Park et al., 2008; Vesper et al., 2008; Karvala et al., 2011; Park et al., 2012). Mold has been associated with nasal and throat symptoms, cough, wheeze, asthma exacerbations in sensitized asthmatics, and hypersensitivity pneumonitis (IOM, 2004). Building dampness and mold was associated with 30-50% increases in a variety of respiratory and asthma-related health outcomes (Fisk et al., 2007). Asthma incidence increased after flooding in North Carolina due to Hurricane Floyd (MMWR, 2000). Reponen et al. (2012) demonstrated a correlation between infantile exposure to molds related to water-damage and the development of asthma in young children. Biocontaminants commonly measured in flooded homes include total culturable fungi and bacteria, endotoxin (found in the cell walls of Gram-negative bacteria), and Î²-D-glucan (found in the cell walls of fungi). 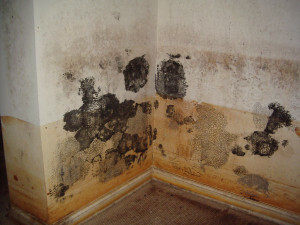 Though some studies have used quantitative PCR (qPCR) and DNA sequencing to measure communities of indoor microbes in hospitals (Oberauner et al., 2013), office buildings (Hewitt et al., 2012), and homes (Dunn et al., 2013), only two studies were identified that applied these techniques to damp rooms (Cai et al., 2009; Cai et al., 2011). Respiratory illness and asthma exacerbations following flooding in New Orleans was found to be positively associated with exposure to water-damaged homes; exposure included just being inside and not participating in any clean up activities. Following Hurricanes Katrina and Rita in 2005, in which 80% of New Orleans was flooded, Cummings et al. (2008) showed a strong association between exposure to water-damaged homes and respiratory issues. Use of the N-95 FF respirator reduced respiratory symptoms, presumably due to decreased exposure to airborne biocontaminants. Chew et al. (2006) tracked biocontaminant concentrations throughout the New Orleans remediation effort and measured only a slight decrease in biocontaminant concentrations after household remediation. In a follow-up study two years after the hurricanes, Adhikari et al. (2010) showed slight decreases in biocontaminant levels compared to those measured directly after the hurricane. Fabian et al. (2005) highlighted similar results: more than 3 months after remediation efforts, indoor air quality was still poor and dominated by biological particles in flooded homes in Colorado. Although it has been hypothesized that flood-related health effects can be mitigated or prevented through remediation, the available remediation methods are often expensive and their utility in reducing microbial exposures remains poorly understood. Flood remediation typically includes drying all wet materials, removing water-soaked flooring and damaged furnishings, replacing drywall and wall coverings, and washing/disinfecting all interior wall cavities, drying remaining structure, and treatment with a chemical biostatic agent (Chew et al., 2006). The use of respirators has been strongly recommended when inside water damaged homes. In-room air cleaners and N95 masks may also be helpful. Good ventilation is essential while remediating. Reports differ on whether remediation efforts are successful at reducing indoor concentrations of microorganisms. Fabian et al (2005) reported that indoor levels remained elevated in remediated homes compared to outdoors. Whereas Chew et al. (2006) reported that indoor levels were mostly reduced compared to before remediation and outdoors. Improved remediation methods would be essential to reducing exposure and health effects after flooding and to help residents move back into their homes quickly. Be careful out there, front range Colorado communities and others who face floods, as you courageously deal with the aftermath of the flood. More information about floods and indoor air quality can be found at http://www.bouldercounty.org/flood/health/pages/flair.aspx. Dunn, Robert R., Fierer, Noah, Henley, Jessica B., et al. PLoS ONE 8(5), e64133 (2013). Fisk WJ, Lei-Gomez Q, Mendell MJ 2007. Indoor Air 17:284-296. Hewitt, K.M., Gerba, C.P., Maxwell, S.L., et al. PLoS ONE 7(5), e37849 (2012). Karvala, K., Toskala, E., Luukkonen, R., et al.. Int Arch Occup Environ Health 84, 713-721 (2011). McMichael, A.J., Woodruff, R.E., Hales, S. The Lancet 367, 859-869 (2006). Min, S.-K., Zhang, X., Zwiers, F.W., et al. Nature 470, 378-381 (2011). Lin, N., Emanuel, K., Oppenheimer, M., et al. Nature Climate Change 2, 462-467 (2012). NFIP, National Flood Insurance Program. Resources: Media Resources — NFIP Statistics. Accessed August 21, 2013. http://www.floodsmart.gov/floodsmart/pages/media_resources/stats.jsp. Oberauner, L., Zachow, C., Lackner, S., et al. Nature Scientific Reports 3, 1413 (2013). Pall, P., Aina, T., Stone, D.A. et al. Nature 470, 382-385 (2011). Park, J.-H., Cox-Ganser J.M., Kreiss, K., et al. Environmental Health Perspectives 116, 45-50 (2008). Park, J.-H., Kreiss, K., Cox-Ganser, J.M. Indoor Air 22, 396-404 (2012). Reponen, T., Lockey, J., Bernstein, D.I., et al. AAAAI 130(3), 639-644 (2012). Shelly Miller is an environmental engineering professor at the University of Colorado Boulder.